Lab rotations are compulsory for all full-time CSI scholarship students. Students would have to participate in at least 2 laboratory rotations (maximum of 3) within 6 months from the start of his/her candidature. Duration of each laboratory rotation is 2-3 months. Duration of each lab rotation would subject to PIs’ approval and availability. Students have the choice of PIs they would like to be supervised by for each laboratory rotation. Supervisor must be a CSI faculty member. 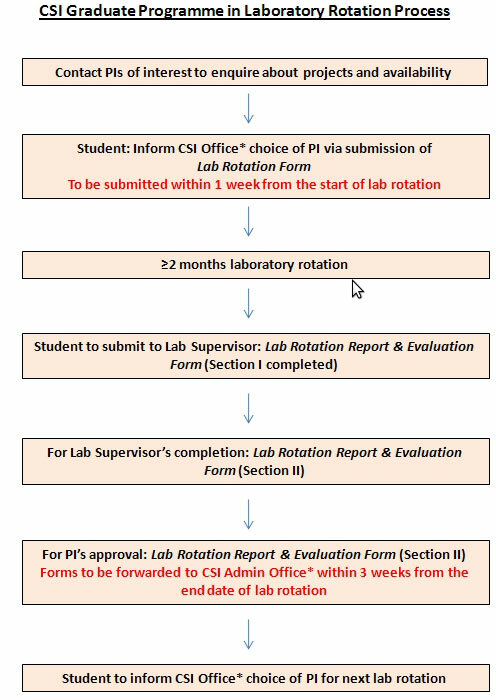 For students who were CSI staff or attachment students, the laboratory rotation of their proposed PI can be taken into account. Only PIs’ signature is required to endorse the hours accumulated for the supervision. The student is responsible for verifying the accuracy of all the information before submission to the CSI office. Students are required to submit Laboratory Rotation Form to CSI Office within 1 week from the start date of lab rotation. Students are required to complete Section I of the Laboratory Rotation Form & Evaluation Form and forward them to their Lab Supervisor and PI. PIs are requested to forward to CSI office within 3 weeks from the end date of lab rotation.